Melos rosin has been made in order to maximise the potential of the string player. The high quality rosin enables the performer to have complete control of the bow when using all kinds of techniques and and dynamics. Available in light or dark, the range consists of violin, viola, cello and double bass rosin. 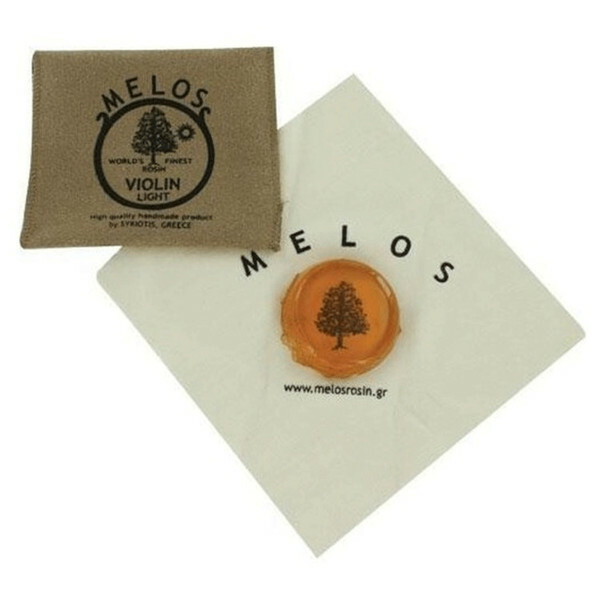 Melos rosin is 100% hand made using some of the finest quality Greek pine tree resin. It is manufactured without the use of other materials like glucose to bind the cake together, making it a much more authentic and professional product. The rosin is always made fresh, so it's in pristine condition when it is first opened up. There is so much scope when purchasing new rosin. Not only is there a different rosin for each string instrument, but there are also light and dark versions of them. Dark rosin is more applicable for colder temperatures, and is most useful in autumn and winter. The light version is useful in summer where the temperatures are warmer. Using the correct rosin will mean that the application to the bow is correct.